The merchant ship hijacked by illegal migrants off the coast of Libya has been escorted to Malta by the country’s armed forces. 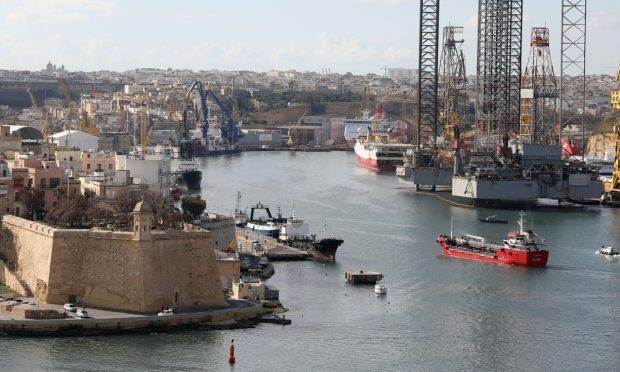 Armed military personnel stood guard on the ship’s deck and a dozen or so migrants were visible as the Elhibru 1 docked at Boiler Wharf in the city of Senglea. Several police vans were lined up on shore and four men who were believed to be suspects in commandeering the vessel were led off in handcuffs. The ship rescued 108 people in the Mediterranean on Wednesday and changed course towards Europe after the migrants realised they were being taken back to Libya.